DeWitt keeps a pure flame, and doesn’t want to hear why others won’t. The abiding theme of Some Trick: Thirteen Stories is thwarted genius — especially where that genius is female. The art world features heavily, as do publishing, music, languages, maths and computer programming—yet it’s all perversely readable, and entertaining. DeWitt is a hot-blooded intellectual, and her contagious passion for the life of the mind can redeem even the bleakest lamentations…In the world of Some Trick, the best words are so acute they lacerate. At times I’ve thought of “geniuses” as those lucky individuals who turn out to have a destiny, one they can convince themselves and many others of at once. To me, DeWitt is an exception: No matter the vicissitudes of the publishing industry, she remains the real deal. DeWitt’s bracing experiments are risks worth taking. One definition of a genius is that she is so dissatisfied with the way the world is that she compels it to adjust to her, rather than following the usual course of adjusting to it. The 13 stories in Some Trick are full of this kind of figure, so much so that the book comes to read like a disguised confession. How do you get a complacent world to stop talking and pay attention? Some Trick suggests that the answer involves stubbornness, oddity, and a great deal of talent. DeWitt’s style is brilliantly heartless, and cork-dry; original herself, she is a witty examiner of human and cultural eccentricity. She can take a recognizable social situation or fact and steadily twist it into a surrealist skein. In Some Trick there are passages and pages that had me laughing out loud—imagine a Bertie Wooster who is not a straightforward dimwit but an eccentrically clever and hermetically erudite dimwit. Some Trick seems less like a story collection and more like a series of notes from some vast, alien intelligence. DeWitt’s characters are savants, weirdos, and artists, often trying to achieve their ends against the best efforts of the well-meaning and conventional people around them. Brilliant and inimitable Helen DeWitt: patron saint of anyone in the world who has to deal with the crap of those in power who do a terrible job with their power, and who make those who are under their power utterly miserable. Certain stories have something in common with dreams: they’re expressions of the creator’s wish-fulfillment. Helen DeWitt’s wishes are distinct in American literature — in world literature, as far as I know. DeWitt’s manic, brilliant new collection…populated by geniuses and virtuosos, the stories are zanily cerebral and proceed with fractal precision. There is much madness in DeWitt’s method, a madness of pure logic. Hilarious. Filled with visual artists, writers, and agents, DeWitt’s layered, sneakily funny collection reads like it came together over years of tinkering. The stories precisely capture (and often skewer) a certain type of cultural elite. With references to Borges, Kafka, Adorno, and Benjamin, among others, stories feature artists who must navigate the “go-getters” necessary for promoting their work. Funny and packed with knowledge, DeWitt’s book masterfully juxtaposes lofty ideals with the banality of everyday realities. Ruthlessly honesty about the sausage making of literary production … DeWitt’s stories are devastatingly specific, and yet they serve as broad parables about the inevitability of being misunderstood, both as an artist and as a person. I like dry humor with a stick of dynamite strapped to it. The forthcoming collection Some Trick by Helen DeWitt, is probably the most recent example. DeWitt is the sort of artist that doesn’t back away from her vision, and she takes the reader with her. A polyglot with a PhD in Classics from Oxford, DeWitt wields an immense intellect that, in each of her books, she uses to cynically delight her readers. The artist-characters in Some Trick, Helen DeWitt’s new collection of bitingly hilarious stories, discover that integrity and commercial success are incompatible, or at most a fluke that can’t be replicated without sacrificing one’s sanity and/or soul. A brilliant, manic new collection. There is much madness in DeWitt’s method, a madness of pure logic. Hilarious. A mind-bending collection of short stories that span such heady topics as statistical computing, religion, and the essence of capital-A Art—what DeWitt summits in substance she also mirrors in readability. 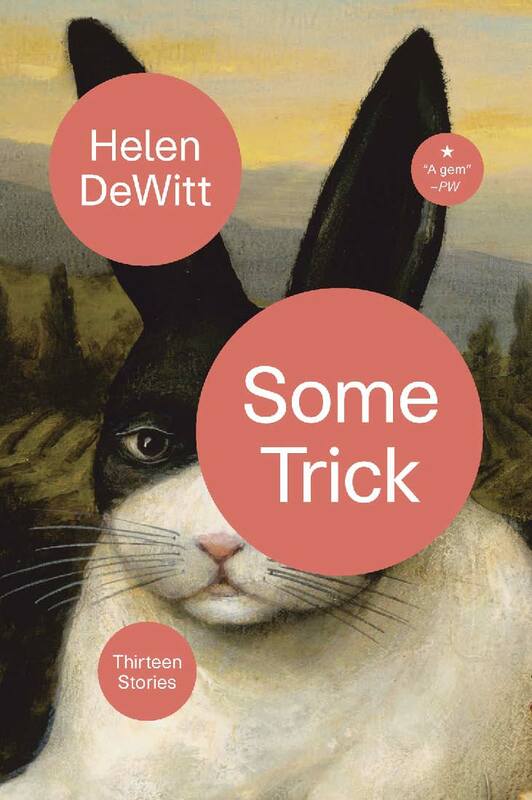 Helen DeWitt combines literary theory, math, and satire in Some Trick, a cerebral collection of 13 stories that digs into the publishing industry, among other topics. DeWitt’s stories are comic and intricate, and cut against the grain of current American fiction in the best of ways. Thirteen ornery but self-aware stories about the vultures who tear apart our culture. There’s some bitterness here but no sanctimony, because the author is almost as funny and self-deflating as she is smart — which is saying a lot. If there’s any author bookish types trust to take them down the twistiest of rabbit holes with humor and winking unpredictability, Helen DeWitt is it. Take the plunge with these 13 short stories. The most radical, off-the-wall, completely astonishing pages you’ll read in your lifetime…. A small-but-mighty tome. A fascinating, expansively erudite thrill. DeWitt applies her mordant virtuosity to territory ranging from statistics to publishing. In this new collection, DeWitt maps a rangy and verbose urban landscape populated by couch surfers, VC bros, underpaid artists, a guitarist on a walkabout, mathematicians, two seemingly different guys named Gil, obscure European novelists and an itinerant heiress fluent in the tinkering grammars of probability, risk and global finance. A few stories in Some Trick feature DeWitt’s version of a happy ending: someone figures out a loophole, a way to maneuver a set of senseless best practices to work for him, and experiences the watered-down relief of solving a problem that shouldn’t exist. DeWitt knows fourteen languages and is conversant in advanced math and computer code… she has harnessed her coder’s brain to negative capability. Compulsive and very funny. The multilingual author, known for her novels The Last Samurai and Lightning Rods, demonstrates her intellectual prowess in this thought-provoking debut collection. These 13 tales, which push the boundaries of fiction, center on misunderstood geniuses and manage to combine complex mathematical theories with razor-sharp wit—no easy achievement. DeWitt reasserts herself as one of contemporary fiction’s greatest minds in this dazzling collection of stories about misunderstood genius. DeWitt’s disdain for those who seek to profit off of genius is sharp and refreshing, and her ability to deliver such astounding prose and thought-provoking stories constitutes a minor miracle. This is a gem of a collection. DeWitt’s wide-ranging intellect makes these stories, but it’s her sense of humor and profound humanity that make them work. She approaches her weirdos and screw-ups with keen-eyed honesty but also with sincere affection. And the first story, “Brutto,” has one of the most satisfying closing lines ever. This collection has many delights, but it’s worth picking up just for that. DeWitt pushes against the limitations of the novel as a form; reading her, one wants to push against the limitations of one’s own brain. An intellectual powerhouse, laugh-out-loud funny in unexpected ways. Her books assert (and often attest) that a work of fiction can encompass many kind of knowledge - probability theory, scatterplots of data, tables of non-Roman alphabets - without compromising its form.